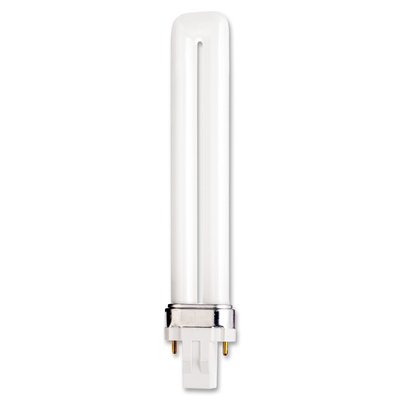 This Twin-Tube Fluorescent Bulb Features A Two-Pin Base That Is Ideal For Use In Exit Signs And Most Desk Lamps. Using Just 13 Watts, This Bulb Provides 12,000 Hours Of Soft, White Light. Twin-Tube Bulb Is Rated At 2,700 Kelvin And Produces 800 Initial Lumens. Tclp Compliant And Meets Rosh Standards.. This Twin-Tube Fluorescent Bulb Features A Two-Pin Base That Is Ideal For Use In Exit Signs And Most Desk Lamps. Using Just 13 Watts, This Bulb Provides 12,000 Hours Of Soft, White Light. Twin-Tube Bulb Is Rated At 2,700 Kelvin And Produces 800 Initial Lumens. Tclp Compliant And Meets Rosh Standards.